batteries, and supercapacitors with ultra-high charging speeds. Graphene’s unique optical properties produce an unexpectedly high opacity for an atomic monolayer and can be seen with the naked eye. This allows for potential uses in flexible optoelectronics or even used as smart wallpaper collecting unused photons and recycling them throughout your house! Graphene is amazingly tough and lightweight. It is the strongest material ever discovered having more than 300 times the tensile strength of structural steel and Kevlar! Its hexagonal shape provides a great barrier for larger molecules which leads to uses in membrane and filtration chemistry, gas sensing, rust resistance and durable material coatings. The peak in scientific interest over the past several decades has sparked developments in the preparation methods for Graphene and related materials as well as the need for cost-effective scientific instrumentation for characterization and quality determination. 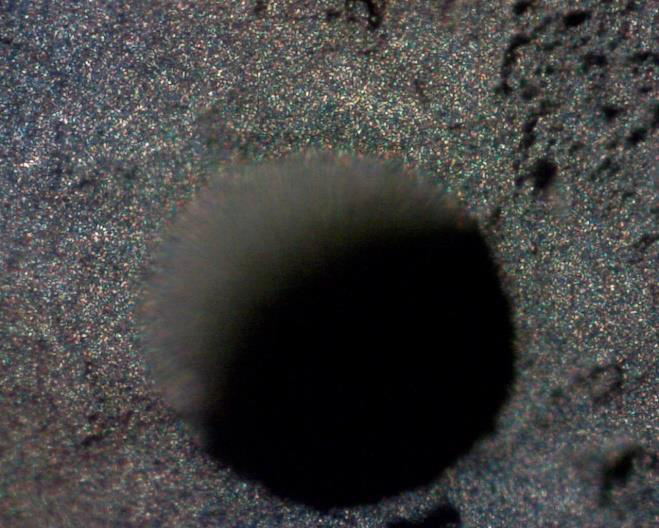 Some techniques such as micromechanical exfoliation, chemical vapor deposition, and epitaxial growth on silicon carbide typically produce higher quality monolayer Graphene while other artificial fabrication routes such as the reduction of a Graphene Oxide (GO) solution and organic synthesis, tend to introduce defects into the Graphene. Typical defects might include vacancies and dislocations, as well as exposing the graphene to oxidation, hydrogenation, fluorination, and other chemical functionalizations. 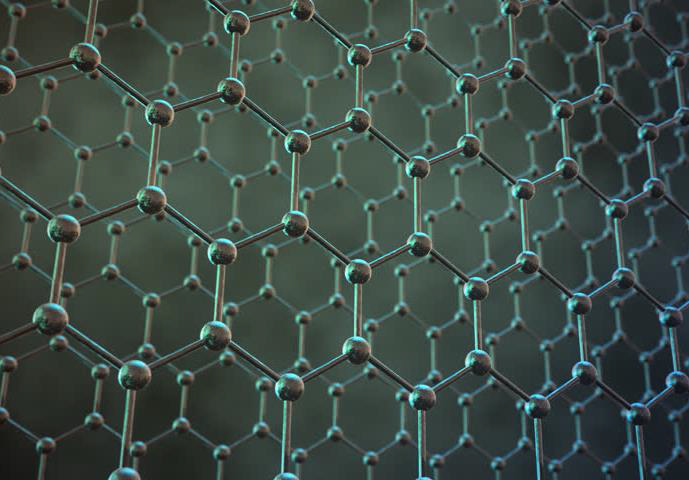 Graphene can also be decomposed into one-dimensional and zero-dimensional forms, such as graphene nanoribbons and nanographene. Note that while there is a general shifting to higher wavenumbers as the layer thickness increases, the more noticeable changes have to do with the band shape. The changes in band shape have to do with changes to the active components of the vibration. 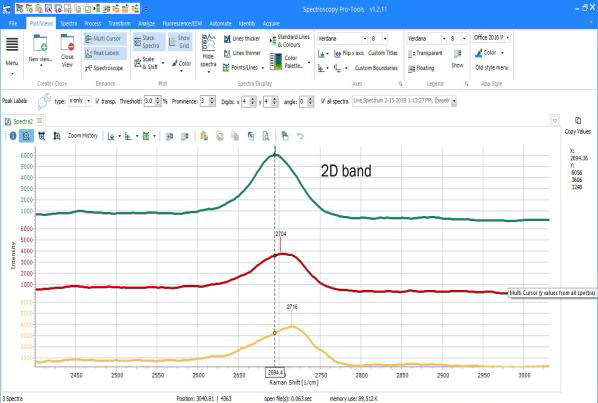 With single layer Graphene, there is only one component to the 2D-band, but with multilayer Graphene, there are several components to the 2D-band. This is why the shape of the band is so different. 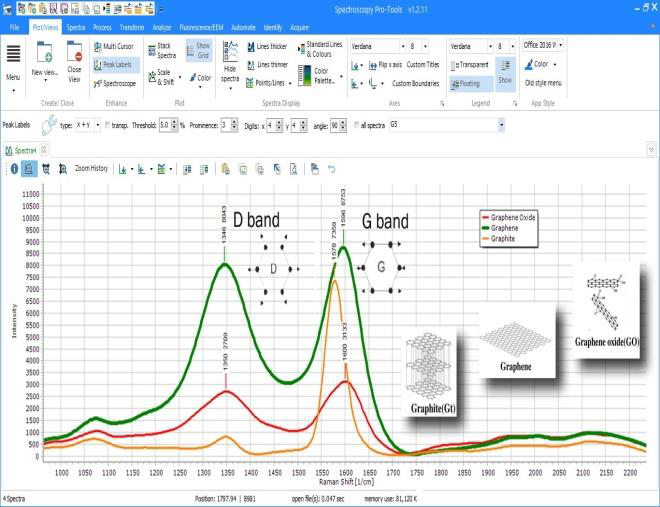 When choosing a Raman instrument for Graphene characterization there are a few factors to consider. Here we discuss some of them from an application standpoint. 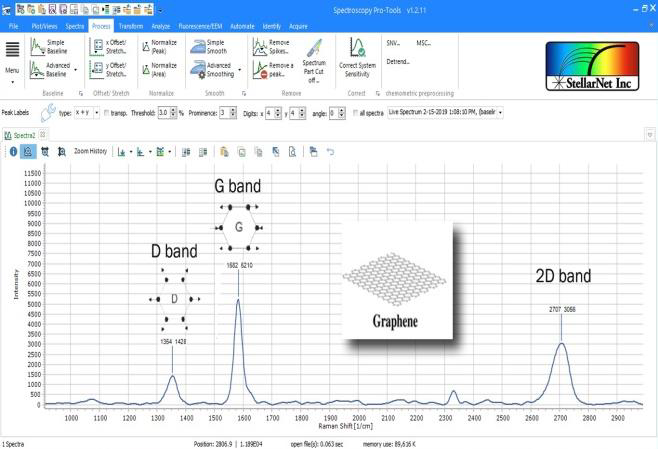 First and foremost, many of the current market solutions for Graphene analysis are expensive high-end Raman microscopy systems, precluding most from easy characterization. In many cases, both academic and industrial departments/research groups share a single machine which is booked between many users. Here, we present a lower cost modular system for Graphene analysis using a laser module, Raman probe, and our HYPER-Nova deep cooled and back thinned Raman spectrometer, with options for microscopy. 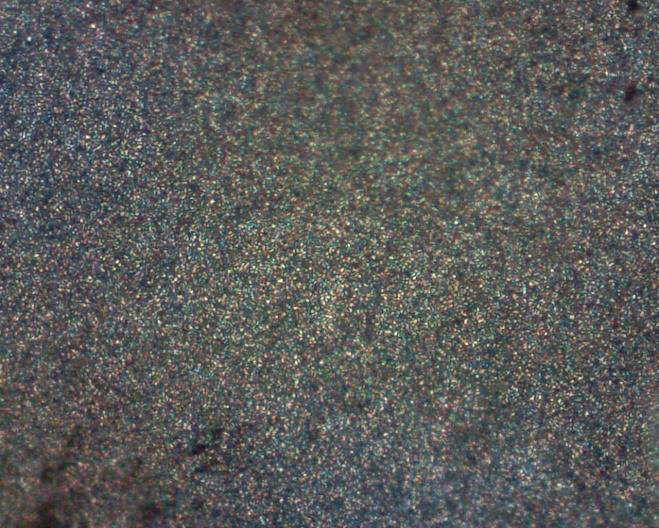 materials can exhibit high fluorescence with NIR lasers (such as 785nm). While it is possible to do Graphene characterization with many different excitation wavelengths, visible lasers such as 633nm or 532nm are typically recommended. Although it is not necessary, using a microscope such as the StellarSCOPE saves time and frustration. Optimizing laser power and adjusting focus can be accomplished in just a few minutes. To optimize laser power first start with a low power and gradually increase until part of your sample burns. You can use the microscope to visually verify that you have ignited your sample. Next, reduce the power and re-adjust the position for your next measurement. 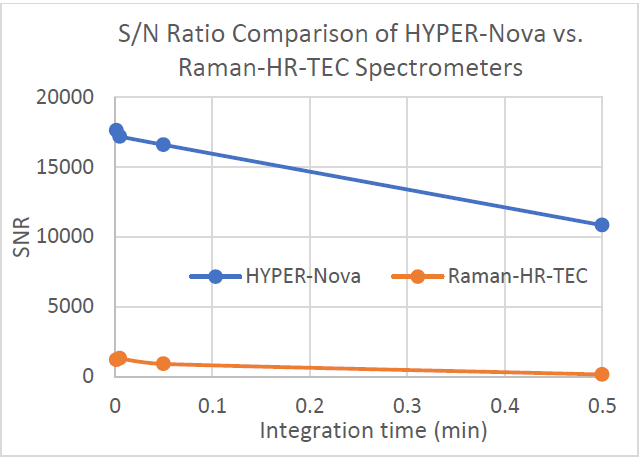 The StellarNet new HYPER-Nova spectrometer uses a research grade back-thinned CCD that is deep cooled to -60 degrees C and has RMS noise values ~20 counts at 3 minutes, which compares to our typical Raman-HR-TEC with ~500 RMS counts at the same exposures. 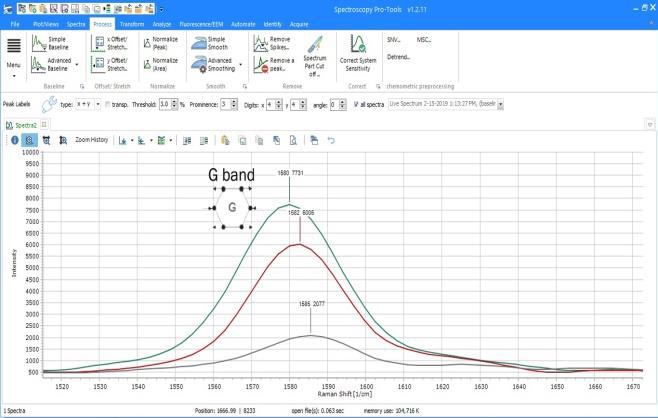 This new instrument achieves the best Signal to Noise of any StellarNet spectrometer and really has been designed out of necessity to bridge the performance gap between high-end instrumentation and our off-the-shelf Raman spectrometers. The HYPER-Nova can meet the performance requirements necessary to capture low Raman scatter from Graphene while maintaining resolution to monitor band shifts and shape changes. This new type of high performance modular system will make Graphene characterization more widely available to researchers and help further increase scientific interest in graphene based materials.